Despite its slim appearance the RVX-42 delivers an adrenaline rush of sound that's set to stun. 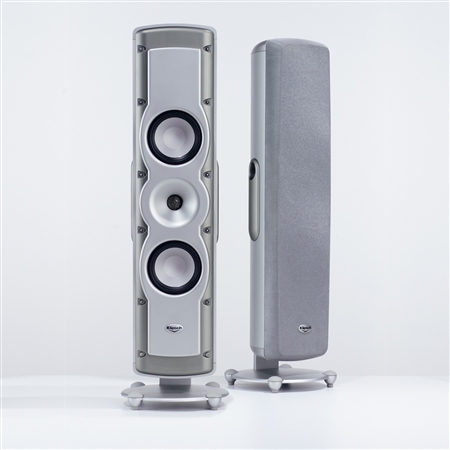 In fact it received a 2004 Distributed Audio Award from Electronic House Expo for being the best on-wall speaker for less than $1000 per pair. With similar flatness and styling to popular plasma and LCD televisions the Klipsch Reference Series RVX-42 is a high-performance audio solution that complements this growing consumer electronics segment. This on-wall model has a single-piece aluminum extrusion enclosure. It employs dual 4-inch Cerametallic™ woofers and uses a 1-inch titanium-dome compression driver mated to a round Tractrix® Horn for maximum clarity and efficiency. The RVX-42 goes well with 42-inch or larger plasma and LCD screens. It also features keyhole mounts (sized for a single-gang electrical box) two 3/8"-16 threaded inserts for optional wall mounts and a pedestal base. 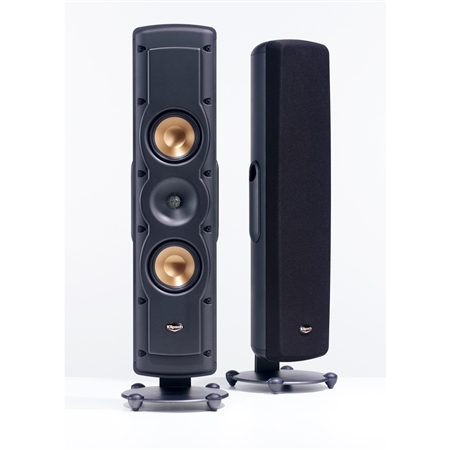 There are two insert locations on the RVX-42 where the pedestal can be positioned - one in the center and one on the bottom so the loudspeaker can either serve as a center channel or bookshelf. Another key feature is a bass compensation switch for the best possible sonic performance either on-wall or off-wall. While no longer in production the RVX-42 is still owned and listened to by Klipsch fans around the world. To connect with other people who are passionate about audio and interested in Klipsch products visit our open forum bulletin board.